WE DO NOT SOURCE GENETICALLY MODIFIED INGREDIENTS. Organic brown rice syrup, organic rolled oats, dried apricots, soy protein isolate, organic cane syrup, organic roasted soybeans, organic soy flour, organic oat fiber, dried cane syrup, organic high oleic sunflower oil, natural flavors, lemon juice concentrate, rice starch, citric acid, sea salt, barley malt extract, organic annatto (for color). ALLERGEN STATEMENT: CONTAINS SOY. MAY CONTAIN WHEAT. MAY CONTAIN PIT FRAGMENTS. Dicalcium phosphate, magnesium oxide, calcium carbonate, ascorbic acid (vit C), dl-alpha tocopheryl acetate (vit E), beta carotene (vit. A), niacinamide (vit. B3), ergocalciferol (vit. D2), thiamine mononitrate (vit. B1), pyridoxine hydrochloride (vit B6), riboflavin (vit. B2), cyanocobalamin (vit B12). Organic brown rice syrup, organic rolled oats, soy protein isolate, organic roasted soybeans, organic cane syrup, rice flour, organic chia seeds, organic dried cranberries, organic soy flour, organic dried cane syrup, dried strawberries, organic high oleic sunflower oil, organic oat fiber, dried cane syrup, natural flavors, citric acid, pomegranate powder, barley malt extract, sea salt, mixed tocopherols (antioxidant). Dicalcium phosphate, magnesium oxide, ascorbic acid (vit C), dl-alpha tocopheryl acetate (vit E), beta carotene (vit. A), niacinamide (vit. B3), ergocalciferol (vit. D2), thiamine mononitrate (vit. B1), pyridoxine hydrochloride (vit B6), riboflavin (vit. B2), cyanocobalamin (vit B12). CONTAINS SOY. MAY CONTAIN WHEAT. May contain traces of peanut or other nuts. ALLERGEN STATEMENT: CONTAINS SOY AND ALMONDS. MAY CONTAIN WHEAT AND OTHER TREE NUTS. MAY CONTAIN NUTSHELL FRAGMENTS. Organic brown rice syrup, organic rolled oats, soy protein isolate, organic roasted soybeans, organic cane syrup, rice flour, organic almonds, concentrated apple puree, organic soy flour, organic oat fiber, dried blueberries, organic high oleic sunflower oil, organic invert sugar syrup, apple juice concentrate, organic glucose syrup, blueberry puree, sea salt, natural flavors, barley malt extract, citric acid, pectin, elderberry juice concentrate (for color), lemon powder, mixed tocopherols (antioxidant). Organic brown rice syrup, organic rolled oats, soy protein isolate, organic cane syrup, organic dried apples, organic roasted soybeans, organic dried cane syrup, organic soy flour, organic raisins, dried carrots, organic oat flour, rice flour, organic high oleic sunflower oil, cocoa butter‡, soy flour, rice starch, natural flavors, sea salt, barley malt extract, nutmeg, soy lecithin, organic cinnamon, cloves. CONTAINS SOY. MAY CONTAIN WHEAT AND TRACES OF MILK. Dicalcium phosphate, magnesium oxide, calcium carbonate, ascorbic acid (vit. C), dl-alpha tocopheryl acetate (vit. E), beta carotene (vit. A), niacinamide (vit B3), ergocalciferol (vit. D2), thiamine mononitrate (vit. B1), pyridoxine hydrochloride (vit B6), riboflavin (vit. B2), cyanocobalamin (vit B12). Organic Brown Rice Syrup, ClifPro (Soy Rice Crisps [Soy Protein Isolate, Rice Flour, Barley Malt Extract], Organic Roasted Soybeans, Organic Soy Flour), Organic Rolled Oats, Organic Cane Syrup, Chocolate Chips (Dried Cane Syrup, Unsweetened Chocolate, Cocoa Butter, Soy Lecithin, Vanilla Extract), Almond Butter, Organic Fig Paste, Cocoa, Almonds, ClifCrunch (Apple Fiber, Organic Oat Fiber, Organic Milled Flaxseed, Inulin [Chicory Extract], Psyllium), Sea Salt, Natural Flavors, Natural Vitamin E (Antioxidant). Organic brown rice syrup, organic rolled oats, soy protein isolate, organic cane syrup, organic roasted soybeans, rice flour, organic dried cane syrup, unsweetened chocolate‡, cocoa‡, organic soy flour, organic high oleic sunflower oil, organic oat fiber, alkalized cocoa‡, natural flavors, cocoa butter‡, sea salt, soy flour, barley malt extract, soy lecithin. CONTAINS SOY. MAY CONTAIN WHEAT AND TRACES OF MILK. MAY CONTAIN NUTSHELL FRAGMENTS. Organic brown rice syrup, organic rolled oats, soy protein isolate, organic cane syrup, organic roasted soybeans, rice flour, dried cane syrup, unsweetened chocolate‡, organic soy flour, organic oat fiber, organic high oleic sunflower oil, cocoa butter‡, barley malt extract, sea salt, natural flavors, soy lecithin, organic cinnamon. ALLERGEN STATEMENT: CONTAINS SOY. MAY CONTAIN WHEAT AND TRACES OF MILK. CONTAINS SOY AND PEANUTS. MAY CONTAIN WHEAT, TREE NUTS, AND TRACES OF MILK. Organic brown rice syrup, organic rolled oats, soy protein isolate, organic cane syrup, organic peanut butter, rice flour, peanuts, organic soy flour, organic oat fiber, organic roasted soybeans, dried cane syrup, unsweetened chocolate‡, natural flavors, sea salt, cocoa butter‡, barley malt extract, soy lecithin. Organic brown rice syrup, organic rolled oats, soy protein isolate, organic cane syrup, rice flour, organic roasted soybeans, organic coconut, organic soy flour, organic oat fiber, dried cane syrup, unsweetened chocolate‡, organic high oleic sunflower oil, organic dried cane syrup, natural flavors, organic unsweetened chocolate, barley malt extract, organic cocoa butter, sea salt, cocoa butter‡, soy lecithin, mixed tocopherols (antioxidant). ALLERGEN STATEMENT: CONTAINS SOY AND COCONUT. MAY CONTAIN WHEAT AND TRACES OF MILK. Organic brown rice syrup, organic rolled oats, soy protein isolate, organic cane syrup, organic roasted soybeans, rice flour, cocoa‡, organic soy flour, organic high oleic sunflower oil, organic dried cane syrup, organic oat flower, organic oat fiber, natural flavors, alkalized cocoa‡, organic cocoa butter‡, sunflower oil, salt, barley malt extract, green tea extract (contains caffeine), unsweetened chocolate‡, soy lecithin, baking soda. CONTAINS SOY AND PEANUTS. MAY CONTAIN WHEAT AND TREE NUTS. Organic brown rice syrup, organic rolled oats, organic cane syrup, organic peanut butter, organic roasted soybeans, soy protein isolate, peanuts, peanut flour, rice flour, organic soy flour, organic oat fiber, natural flavors, sea salt, barley malt extract. Organic Brown Rice Syrup, ClifPro (Soy Rice Crisps [Soy Protein Isolate, Rice Flour, Barley Malt Extract], Organic Roasted Soybeans, Organic Soy Flour), Organic Rolled Oats, Organic Molasses, Safflower Oil Roasted Pecans, Soy White Chocolate (Organic Dried Cane Syrup, Cocoa Butter, Soy Flour, Soy Lecithin, Organic Vanilla Extract), ClifCrunch (Organic Oat Fiber, Inulin [Chicory Extract], Organic Milled Flaxseed, Organic Oat Bran, Organic Psyllium), Organic Raisins, Organic Soy Butter (Organic Roasted Soybeans, Organic Soybean Oil, Salt), Crystallized Ginger (Ginger, Dried Cane Syrup), Natural Flavors, Spices (Ginger, Cinnamon, Cloves, Nutmeg), Sea Salt, Natural Vitamin E (Antioxidant). Organic Brown Rice Syrup, ClifPro (Soy Rice Crisps [Soy Protein Isolate, Rice Flour, Rice Starch, Barley Malt Extract], Organic Roasted Soybeans, Organic Soy Flour), Organic Rolled Oats, Walnuts, Organic Toasted Oats (Organic Oats, Organic Dried Cane Syrup, Ascorbic Acid, Natural Vitamin E [Antioxidant]), Organic Diced Bananas (Organic Bananas, Organic Rice Flour), Organic Cane Syrup, Chocolate Chips (Dried Cane Syrup, Unsweetened Chocolate, Cocoa Butter, Soy Lecithin, Vanilla Extract), ClifCrunch (Organic Oat Flour, Inulin, Organic Milled Flaxseed, Organic Oat Bran, Psyllium), Organic Banana Powder, Organic Soy Butter (Organic Roasted Soybeans, Organic Soybean Oil, Salt), Organic Date Paste, Natural Flavors, Sea Salt, Cinnamon, Natural Vitamin E.
Organic brown rice syrup, organic rolled oats, soy protein isolate, sunflower seeds, organic cane syrup, organic almonds, organic peanut butter, rice flour, organic roasted soybeans, organic sunflower seed butter, organic soy flour, organic pumpkin seeds, organic oat fiber, natural flavors, sea salt, sunflower oil, barley malt extract, mixed tocopherols (antioxidant). ALLERGEN STATEMENT: CONTAINS SOY, PEANUTS, AND ALMONDS. MAY CONTAIN WHEAT AND OTHER TREE NUTS. MAY CONTAIN NUTSHELL FRAGMENTS. CONTAINS SOY AND WALNUTS. MAY CONTAIN WHEAT. MAY CONTAIN NUTSHELL FRAGMENTS. Organic brown rice syrup, organic rolled oats, organic raisins, soy protein isolate, organic roasted soybeans, organic cane syrup, walnuts, organic soy flour, rice flour, organic oat fiber, organic high oleic sunflower oil, natural flavors, organic cinnamon, rice starch, sea salt, barley malt extract, mixed tocopherols (antioxidant). Vitamins & Minerals: Dicalcium Phosphate, Magnesium Oxide, Ascorbic Acid (Vit. C), DL-Alpha Tocopheryl Acetate (Vit. E), Beta Carotene (Vit. A), Niacinamide (Vit. B3), Ergocalciferol (Vit. D2), Thiamine Mononitrate (Vit. B1), Pyridoxine Hydrochloride (Vit. B6), Riboflavin (Vit. B2), Cyanocobalamin (Vit. B12). Organic brown rice syrup, organic rolled oats, organic cane syrup, soy protein isolate, organic peanut butter, organic peanuts, rice flour, organic dried cane syrup, peanut flour, organic oat fiber, organic roasted soybeans, organic soy flour, natural flavors, organic cocoa butter‡, salt, barley malt extract, green tea extract (contains caffeine), organic soy lecithin. Organic Brown Rice Syrup, ClifPro (Soy Rice Crisps [Soy Protein Isolate, Rice Flour, Barley Malt Extract], Organic Roasted Soybeans, Organic Soy Flour), Organic Rolled Oats, Organic Pecans, Pecan Pralines (Organic Dried Cane Syrup, Pecan Pieces, Salt), Organic White Coating (Organic Dried Cane Syrup, Organic Cocoa Butter, Organic Soy Lecithin, Organic Vanilla Extract), Organic Cane Syrup, ClifCrunch (Organic Oat Fiber, Inulin, Organic Psyllium), Organic Date Paste, Organic Sunflower Oil, Natural Flavors, Sea Salt, Organic Cinnamon, Natural Vitamin E (Antioxidant). Vitamins & Minerals: Dicalcium Phosphate, Ascorbic Acid (Vit. C), Magnesium Oxide, DL-Alpha Tocopheryl Acetate (Vit. E), Ferric Orthophosphate (Iron), Beta Carotene (Vit. A), Zinc Citrate, Biotin, Niacinamide (Vit. B3), D-Calcium Pantothenate (Vit. B6), Ergocalciferol (Vit. D2), Cyanocobalamin (Vit. B12), Chromium Chloride, Potassium Iodide. Organic brown rice syrup, organic rolled oats, organic raisins, soy protein isolate, rice flour, organic cane syrup, organic peanuts, organic peanut butter, organic roasted soybeans, organic oat fiber, organic soy flour, dried cane syrup, organic pumpkin seeds, unsweetened chocolate‡, sunflower seeds, sea salt, natural flavors, cocoa butter‡, barley malt extract, sunflower oil, soy lecithin, mixed tocopherols (antioxidant). ALLERGEN STATEMENT: CONTAINS SOY AND PEANUTS. MAY CONTAIN WHEAT, TREE NUTS, AND TRACES OF MILK. Organic brown rice syrup, organic rolled oats, soy protein isolate, organic cane syrup, organic roasted soybeans, rice flour, macadamia nuts, organic dried cane syrup, organic oat fiber, organic soy flour, cocoa butter‡, organic high oleic sunflower oil, natural flavors, organic cocoa butter‡, sea salt, soy flour, barley malt extract, sea salt, soy lecithin, mixed tocopherols (antioxidant). CONTAINS SOY AND MACADAMIA NUTS. MAY CONTAIN WHEAT, OTHER TREE NUTS, AND TRACES OF MILK. MAY CONTAIN NUTSHELL FRAGMENTS. High in protein and fiber, and no trans fats! Good for the Environment! Cliff Bar uses 70% organically farmed ingredients to protect your health and our Earth. 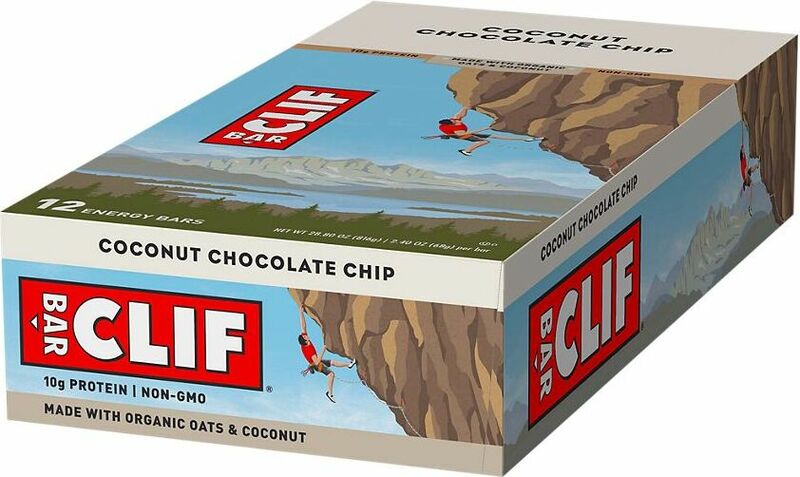 Cliff Bar packaging boxes use 100% recycled materials. What are the nutritional benefits of Clif Bars? Clif Bars contain carbohydrates, good to excellent amounts of protein (9-11 grams) and good amounts of fiber (4-5 grams). Clif Bars also contain 23 vitamins and minerals and are free of trans fats, hydrogenated oils, high fructose corn syrup, artificial sweeteners, artificial flavors, artificial preservatives and ingredients sourced from GMOs. Clif Bar is the original energy bar made with organic ingredients that delivers an optimal blend of nutrition for sustained energy. Clif Bar uses whole ingredients you can see and taste, such as oats, dried fruits and nuts, to create delicious, convenient food that’s good for you and for the planet. Athletes and active people have high energy demands. With a mix of carbohydrates, protein and fiber, Clif Bars supply working muscles with the energy they need for extended periods of activity. Wholesome and nutrient-dense, Clif Bars steadily increase blood sugar levels without creating a precipitous “sugar crash.” Clif Bars help athletes and active people who respect their bodies and the planet to push farther with sustained energy. For best results, Clif Bars should be eaten about one to three hours before exercise along with water to prevent hunger and supply energy to working muscles. During prolonged, lower intensity exercise such as hiking or bike touring, Clif Bars can be eaten during activity to help satiate hunger and meet carbohydrate demands. Clif Bars can also be eaten after exercise, as a snack between meals or during a long, busy day to help sustain energy. Are Clif Bars appropriate for kids to eat? Because Clif Bars are formulated with adult needs in mind, children should not eat a whole bar until their nutritional needs more closely match those of an adult (around ages 9-13). Children ages 4-9 could have half on occasion and as with all food choices, parents should use their best judgment. How are Clif Bars different from other bars? Clif Bar uses whole ingredients you can see and taste, such as oats, fruits and nuts, to create delicious, convenient food that’s good for you and for the planet. Why are Clif Bars made with 70% organic ingredients? Organic farming and agriculture is good for people and the planet. By using organically grown ingredients, we help keep harmful pesticides and synthetic fertilizers out of the environment and our bodies. Organic produces less pollution and helps create nutrient-rich soil and increases biodiversity. Organic foods are a healthy choice to sustain people and the planet for future generations. Do Clif Bars contain GMOs or bioengineered ingredients? Clif Bar & Company is committed to sourcing ingredients that are not genetically engineered in all of our products. We have stringent protocols for GMOs which includes requiring affidavits from ingredient suppliers demonstrating they can meet our non GMO requirements. Clif Bars are Kosher Dairy. There are no dairy products in our bars; however, the vendor we purchase our non-dairy chocolate chips from makes chips containing dairy in the same building. Yes. There are no ingredients derived from animals in Clif Bars. Do Clif Bars contain gluten? All Clif Bar flavors contain organic rolled oats and barley malt extract. Oats and barley malt extract contain a natural amount of gluten. Gluten is an elastic protein substance naturally occurring in most grains. On the Nutrition Facts food label, are the grams of Other Carb. in addition to the Total Carb. listed? No, the Total Carb. includes all carbohydrates fiber, sugar, and other carbs. Can you eat Clif Bars if you are allergic to nuts? No, all Clif Bar flavors may contain traces of nuts. Is there any caffeine in Clif Bars? Yes, there are 3-5 mg of caffeine in Chocolate Chip, Chocolate Brownie, Chocolate Chip Peanut Crunch, Chocolate Almond Fudge and Cookies 'n Cream. Chocolate naturally contains a trace amount of caffeine. Cool Mint Chocolate and Peanut Toffee Buzz each contain 50mg of caffeine from green tea extract. Why is there no dairy in your chocolate? Not all chocolate has dairy. We use semi-sweet chocolate, the main ingredient of which is cocoa butter. What is the difference between whole rice syrup and brown rice syrup? Whole rice syrup refers to rice syrup derived from unprocessed kernels of rice, either brown or white. Brown rice syrup is derived solely from kernels of brown rice. What is rice crisp? Is it baked or puffed? Rice crisp is puffed rice. Why is the protein content in the Chocolate Chip Peanut Crunch and Crunchy Peanut Butter Bar so high? The protein in those Clif Bar flavors comes from peanuts and soy nuts. Is there any MSG in Clif Bars? Yes, our bars do not contain any genetically modified ingredients. What is evaporated cane juice? It is natural sweetener made from the juice of sugar and is less processed than other sugars. What are the approximate diabetic exchanges of the bar? Carbohydrate 3, lean protein 1, fat 1. How much soy protein and isoflavones are in the bar? The bar ranges from 8-10 grams of soy protein and 9-16 milligrams of isoflavones. Is a Clif Bar a meal replacement? No, they do not have enough calories in them to replace a whole meal by themselves. Having a Clif Bar with a piece of fruit or yogurt would add to the calorie content and may hold you over a bit longer. Are there any herbs in the bars? No, there are no herbs/botanicals in the bars. Omega-3 fatty acids are polyunsaturated fats that promote heart health and may reduce the risk of many other diseases. What are the sources of Omega-3's in Clif Bar? Omega-3's come in different forms from various foods. Clif Bar contains omega-3's in the form of alpha linoleic acid (ALA) from organic flaxseed and walnuts. ALA is converted Eicosapentaenoic acid (EPA) and docosapentaenoic acid (DHA), forms of omega-3's readily used by the body (found in fish such as salmon, cod, and tuna). There is a growing body of evidence that suggests EPA and DHA can help to lower cholesterol and decrease inflammation both of which are associated with promoting heart health.